Many Deerhound owners will have experienced this feeling and I love the quote, so today Rogue would like to wish all humans on earth, peace . . . if only all could learn from this . . . I hope all Deerhounds worldwide enjoy the sentiments of this gathering of the clan - Ceád Mile Fáilte! 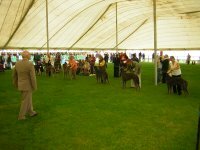 Ricky, whilst at SKCC show this weekend had an interesting conversation with Glenn and Nicola Bailey of the Greyflax kennel. Nicola re-canted the story of when she was inspired to locate and purchase her first Scottish Deerhound. She told a rather fun tale of how she visited Scotland 28 years ago thinking she would find Deerhounds on every street corner only to be surprized to find that most of the people she spoke with, didn’t even know what kind of dog she was talking of. This reminded Ricky of the regular events that so many Scots have encountered when they are travelling the world and become involved in conversation with a non Scot who has previously conversed with a Scotsman, they oft’ ask . . . ‘do you know Jock from Glasgow?’ as if we all live in the same street. 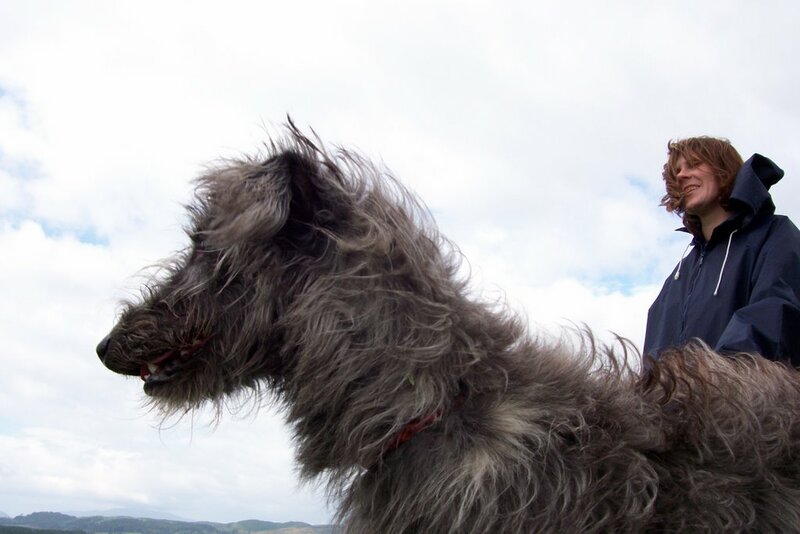 The conversation with Nicola and Glen has ignited a train of thought, to revisit how, where and who would know about Deerhounds in Scotland and what corners would you have to visit to find knowledge about, or of one. 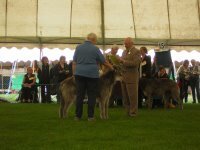 Strangely enough, when Ricky was growing up, it was not uncommon to see many more breed of dog on the street, types that are more often only viewed at show arenas today. 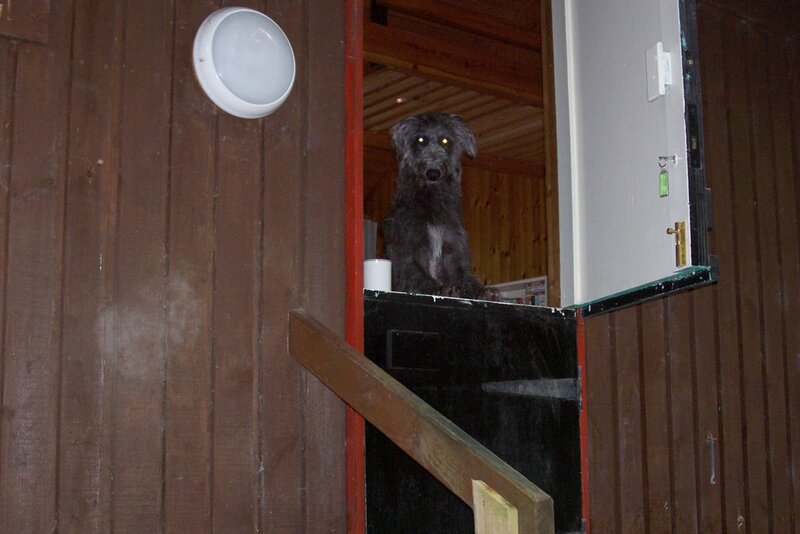 His grandfather had Airedales, his father had Bedlingtons, I was informed Ricky was brought up by a Bedlington named Carlo, this may explain his temprament ha! ha! 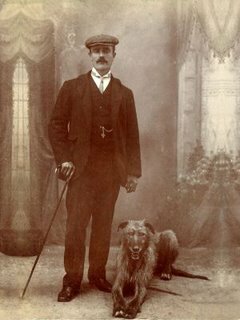 Back then, in the Sixties, if you were to visit the Tally-Ho Public bar in Winchburgh, West Lothian on a Saturday afternoon, you might find Deerhounds, Whippets, Terriers and Lurchers gracing the outside of the pub as the working community enjoyed their afternoon pint and traded in game, fresh from the surrounding countryside, mostly obtained through the excitement of natural participation, but it did add flavour to the pot. In 18th, 19th and early 20th century working communities (many, which historically, sprang up from highlanders in need of employ as they gravitated toward industry such as mills, mining, ship building) across Scotland, dogs have long been a source of pride, and with the increase in popularity of photography in the earlier part of the 20th century, it was not uncommon to dress yourself out in ‘Sunday Best’ and be photographed with your hound, similar to that of the image above. This lifestyle and relationship of working dog amongst the working class was probably at it’s twilight period in the sixties/early seventies - a last of the summer wine so to speak - as lifestyles changed and many who would use dogs for ‘poaching’ became slightly more affluent, then the need to hunt good food was simply a matter of visiting one of the ever expanding local supermarket chains, the dogs use as hunter wained. Although there has been recent report made of dogs illegaly running in hunt of deer, across central Scotland. This is possibly only reported to bolster the anti-hunting laws introduced in the UK forbidding the use of us hounds. 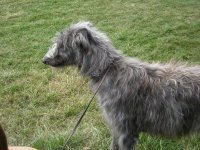 Strangely on the point of who knows deerhounds in Scotland, when I walk with Ricky its the hardend, tattoo bedecked, worky, the gamekeeper and estate owner that more often than not, identifies me as a deerhound - others who believe they know?! 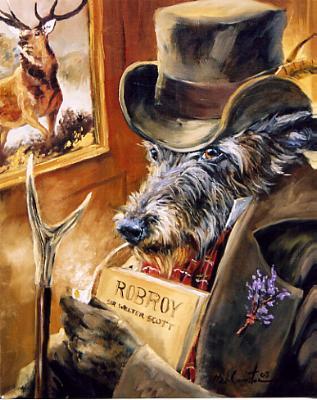 anounce ‘Oh a wolfhound’ or simply ask if I eat a lot, or bite, or most droll of all ‘you should put a saddle on him’. I look forward to the last comment for another several hundred times over the forthcoming years. 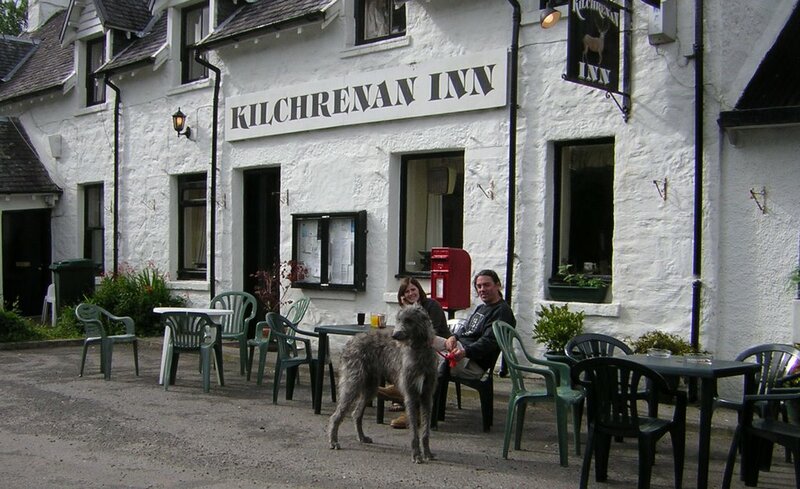 As for deerhounds on the corner, it may have been that Nicola visited the wrong ‘pubs’ in her quest to find a Scottish Deerhound or as Ricky pointed out to her, Scotland is a big place (if you were to flatten it all out), and there are lots of places to hide. But not to worry, soon you will be able to view auld Rogue here, photographed on almost every corner of Scotland as I continue my adventures on the blog. And as we say up here in Scotland . . . I awake to my first copy of The Claymore, the Scottish Deerhound of America club newsletter, which arrived in my postbox this morning. Soon, I am taken for a long early morning walk. 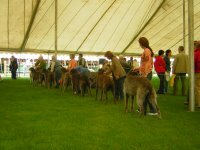 Following this, whilst I sleep through the rest of the morning, my human companions visit the Scottish Kennel Club show at The Royal Highland Showground, Ingliston. See the pics above - the first photograph is of myself but not at the show of course. Video footage was also recorded at the SKCC which I will post here, next blog. When the family arrived home I was given a new bedding mat for journeys in the car, some nice holistic treats to enjoy and a new rope leash, as I successfully managed to destroy my previous leash after swiping it from the worktop one day. 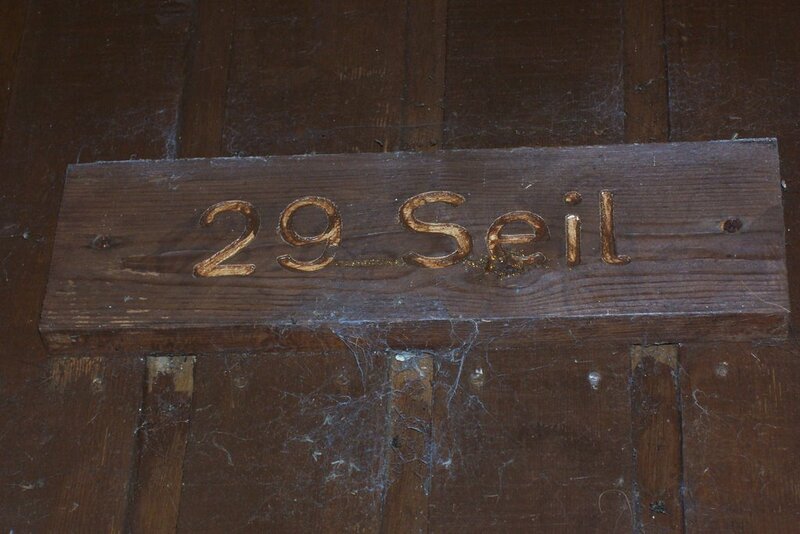 I was also informed that my cousins in Kilmartin, Argyll were most upset that I did not drop in and visit them. I will put this to rights in future and hope to get the chance to meet with them soon. Here I am on holiday, just over a week ago, as we visited the former stronghold of the enobled Campbell family, who took the name Breadalbane. The location is Kilchurn Castle found at the Northernmost tip of Loch Awe. 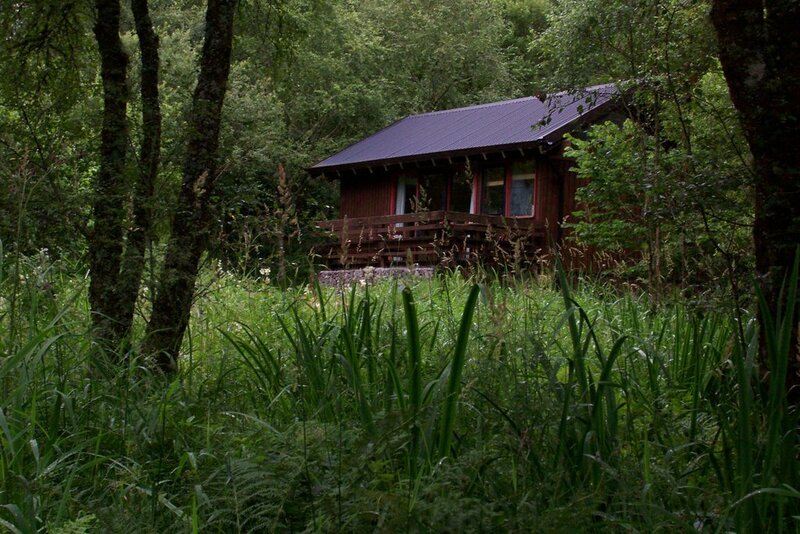 If you would like to find out a little more about Kilchurn, simply click on the links. 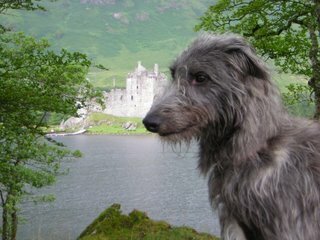 As you know, we love to keep all deerhounds out there informed. You may be familiar with the name Breadalbane, which is from the Gaelic for ‘the High country of Scotland’, and there is reference to a most magnificent brace of Deerhounds being produced for the Marquis of Breadalbane. Punch magazine once carried this little Scotch Poem . . . The mossy howes, the heathery knowes, and ilka' bonny park is his. The tinkers' tents, the crofters' rents and ilka' collie's bark is his. The muircock's craw, the piper's blaw, The ghillie's hard day's wark is his. Frae' Kenmore to Ben Mhor The warld is all the Marquis's. 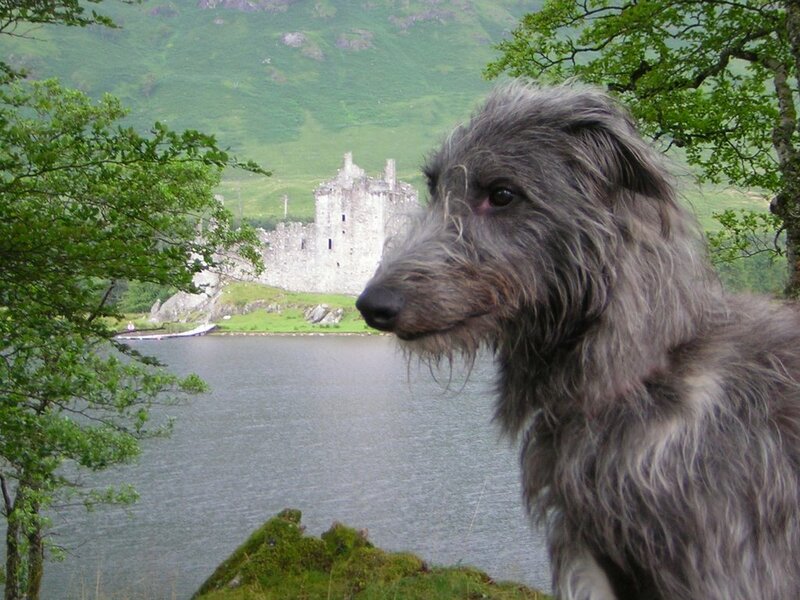 But did you know, perhaps because of this sentiment, of the curse that was placed upon the Breadalbane family line, and that the cursed family line unlike we Deerhounds has ended - click here to read a little of the tale. You can also find out more interesting information on Kilchurn and Loch Awe from wikipedia but I’ll leave them searches up to you. 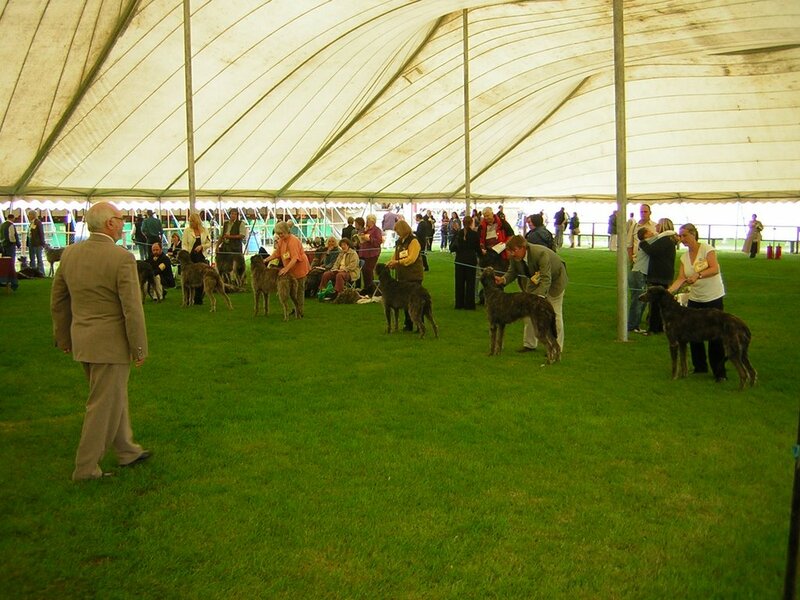 Here I am with lots of friends at my first Scottish Pedigree Whippet Club Open Race Meet from Sunday 13th at Ochteryre, near Stirling. That’s me third in the first race, I didn’t bother going between the finish posts and I coulda been second, or first even, had I known we were supposed to be chasing the lure and not just out running with the other dogs making friends. Still, I would rather haver the friends. Enjoy the other races, if you know deerhounds in Scotland, you may know some of the human faces. If you don’t, come and visit us. Here I am. 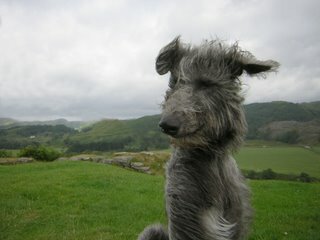 Will I be the first Deerhound to stand atop Dunadd Fort? This is the foundation stone of Scotland. Situated in the Kilmartin Glen with a history thousands of years rather than hundreds. I bet with so many other deerhound owners living in and around about this area and the age of the location, it’s unlikely I’m the first deerhound up here. Still it’s blowing a gale and it is exceptionally warm for Scotland in August. If you wonder what I’m talking of when I mention Dunadd, Dál Riata or Dalriada just click on the names for further information. Not only is this blog what old rogue here, one year old today, is up to, but it’s historically informative to. Oh! 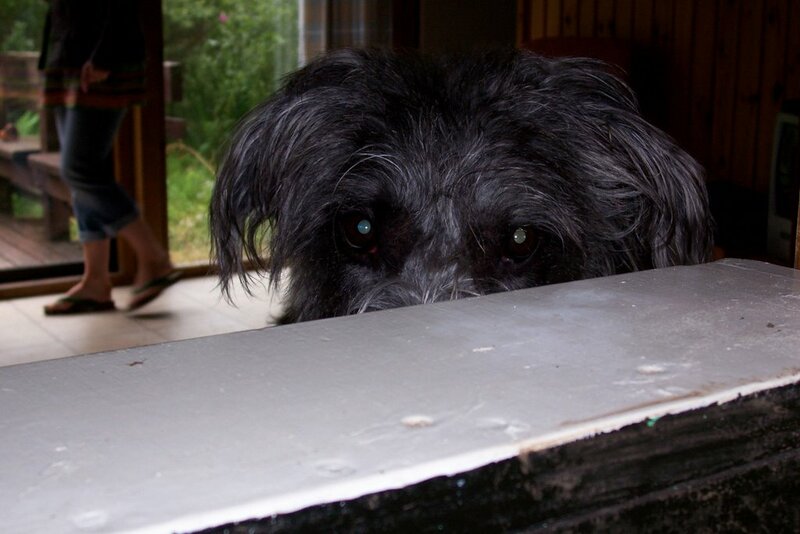 and most importantly today - Get well Lyra. 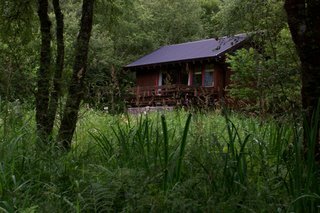 Where better a location to be after a days stalking through the hills and glens of Argyll, than a restful roadside inn. Here we are at Kilchrenan Inn, just by the junction on the road to Ardanaiseig on this lovely summers evening. The sign above the doorway here indicates that deer are a part of daily life in this part of the world. 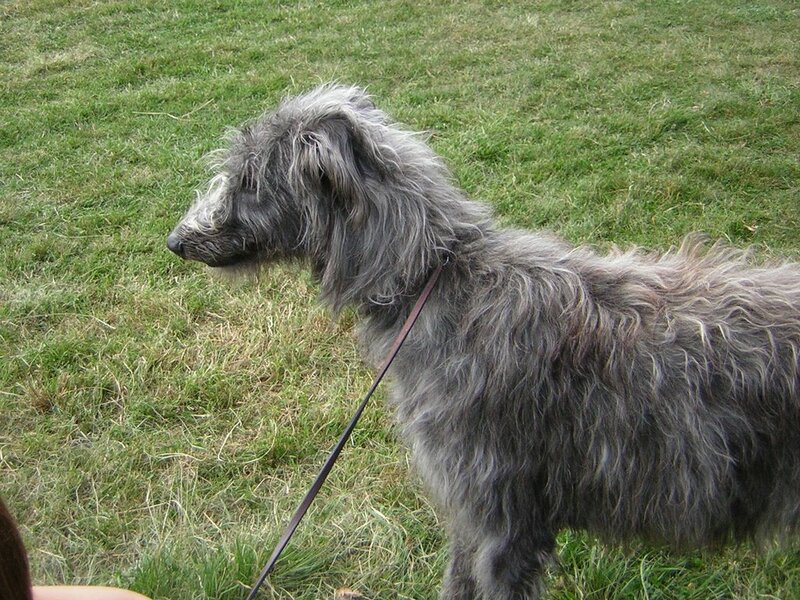 I wonder if it could be where the deerhound standard and rugged appearance as we know it sprang from - it certainly where the country of Scotland eminated from. And ‘Ardkinglas’ home to the deerhound kennels of legend is only a few miles south of where I’m poised in this photograph. Interestingly, whilst legends are mentioned in this blog, I can tell you that approximately a mile along this road there stands a stone, where it is said you may meet the ghost of a headless monk. I don’t know if I would have been sitting enjoying my meal quite so calmly had I known about this - but hey! I’m a dog and I didn’t sense any spirits around so it didn’t worry me to much. The story goes, that some pagans who took exception to the christian teachings of the monk apparently beheadead him on this stone by the roadside. If only they had all come down to the Kilchrenan Inn for some lovely fish and chips and a little scenery appreciation they may have all been in a more understanding frame of mind. Although I don’t think the Inn was around at the time. I would recommend anyone passing the Inn to pop in for a ‘bite to eat’ or maybee a ‘fly wee hauf’ or a ‘pint’. Bonnie Kilchrenan near the wonderful Loch Awe.